The basic tracks for the album Tin Machine II were written and recorded in just over three weeks in Sydney. 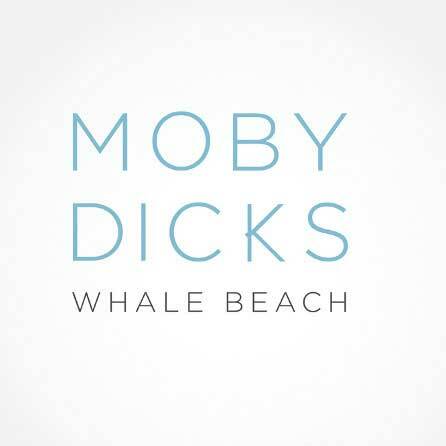 While the first album was all about manic sparks, it has been noted that this second album reflects the bands impressions of Australia. As one example, the album outtake "Needles on the Beach" had a title directly inspired by an issue facing Sydney at the time - used needles turning up on beaches. Another song - 'Amlapura' - however, was not about Australia at all but nearby Indonesia. "[Sydney, Australia] had a big impact on how the record sounds. One of the nice things about working there was that we could go out and have a cappuccino at a sidewalk cafe. The Australian attitude is really cool. No one would ever think to hassle anyone in the band. And that definitely affected our approach - there wasn't as much pent-up energy, not as much of a mad-at-the-whole-world feeling. "We opted to go someplace that most of the band had never been to before, I've always found that incredibly stimulating. If you can tap into all these initial feelings when you go to a foreign place, then I think it can often produce something that is very worthwhile"
It may sound like a chicle, but a lot of tracks have an openness to them. 'You Belong in Rock n Roll' and even 'Shopping For Girls' to a certain degree, have a bigger horizon to them conically, and I think Australia had something to do with that. It's a place that moves slower and it's so wide open, almost like Texas". Lyrically, especially, David really responds to what is going on around him. Making this album was more of a journey inside, thinking about relationships, the romantic side, instead of trying to point out the problems in the world"
In a turn around from mere recording ... on November 4, 1989, Tin Machine burst on to the local Sydney pub scene to play a concert of several live numbers - completely unannounced. The gig took place at a small venue named Moby Dicks and it had been 4 months since Tin Machine had played any live shows at all. "Some of [the people that were there] had no idea of what was about to happen. Shortly after I arrived they came on stage and did a blistering set of tracks from Tin Machine II. A unique experience to say the least!!! Craig Braun from EMI told me shortly after the band left that we were invited back stage to see the band, but he said he was "too tired" and said no thanks.....he just wanted to get home!! When I met up with Bowie back stage after his last here in Melbourne he mentioned that gig and I reminded him of the location and venue. He put it in the list of tours/gigs that he had done in Australia". Bowie also told the Australian press that the band would play other unannounced concerts in Australia, however, as far as we know, they never did. 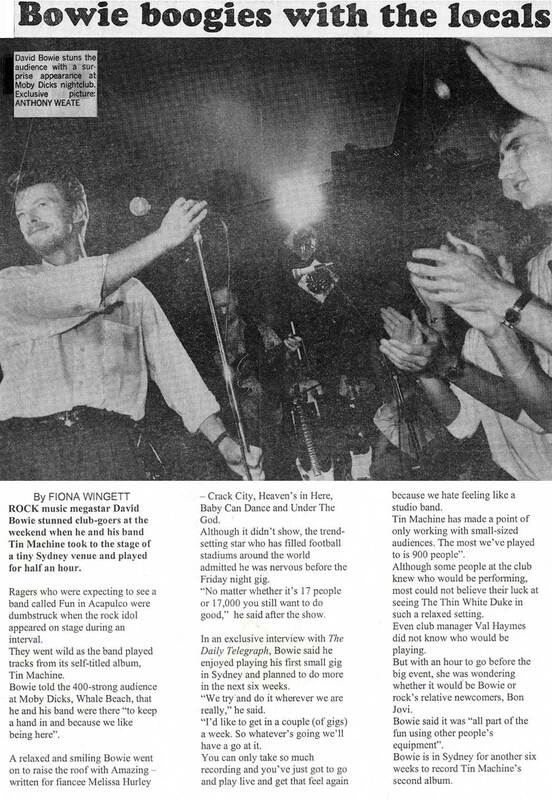 The next Bowie show on Australian shores would come fifteen years later --> Brisbane 2004. Much thanks to Bowie fan, David Fowler for sending in this article and the one below. 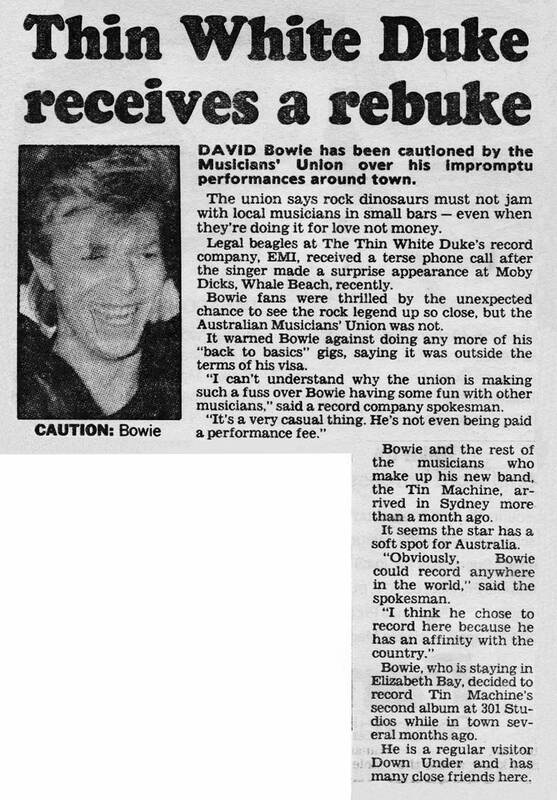 Finally it appears that the Tin Machine gig at Moby Dicks caused Bowie to be cautioned by the music union. Further details in the article below.